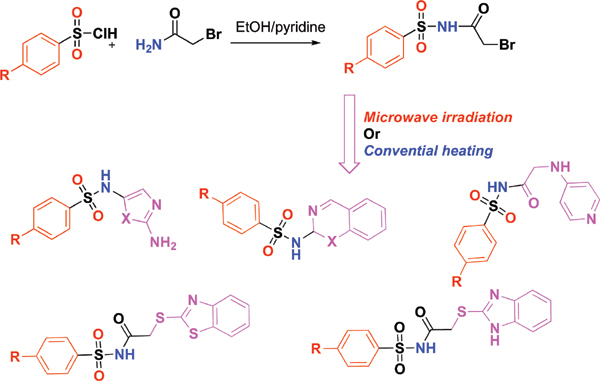 Background: This paper describes the synthesis of novel fused heterocycles from the reaction 2-Bromo-N-(phenyl sulfonyl) acetamide derivatives with nitrogen nucleophilic reagents were carried out under microwave radiation and conventional heating. The synthesized compounds are excellent utilizing microwave irradiation rather than conventional heating. Methods: Synthesis of sulfonamide derivatives was carried out under microwave radiation and conventional heating. Results: Schotten-Baumann reaction for the synthesis of Bromo-N-(phenyl sulfonyl) acetamide derivatives by treatment of sulfonyl chloride derivatives with 2-bromoacetamide in pyridine. Reactivity of Bromo-N-(phenyl sulfonyl)acetamide derivatives towards urea derivatives to afford the corresponding aminothiazole and aminooxazole derivatives, benzofused heterocyclic derivatives. Conclusion: In this investigation, we have synthesized novel aminothiazole, amino oxazole, benzo[e] [1,3]oxazin, benzo[e][1,3]thiazin, quinazoline-2-yl, (pyridine-4-ylamino)acetamide, 2-(benzo[d]thiazole- 2-ylthio) and 2-((1H-benzo[d]imidazol-2-yl)thio) derivatives incorporating sulphonamide moiety utilizing Microwave irradiation and Conventional heating. The products were obtained under microwave reaction in excellent yields in a short reaction time. Sulfonamide, thermal heating, microwave irradiation, heterocycles, benzofused heterocyclic, nucleophilic.